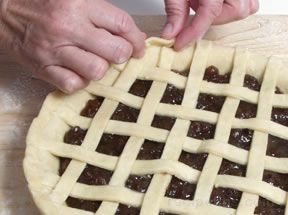 "I love these tips, however, could someone post a picture of the diamond lattice ... read full review"
Brush lightly with milk or cream to give the pie a richer color. Brush with egg whites to glaze the crust. 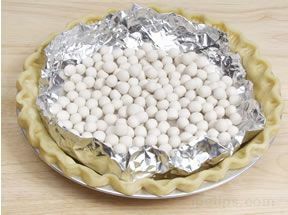 Sprinkle lightly with sugar to give the crust a sparkle and add crispness. 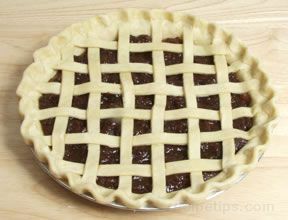 Some common decorative pie toppings that are used are lattice tops, diamond tops, and spiral tops. Shown below are instructions on how to accomplish the decorative tops. 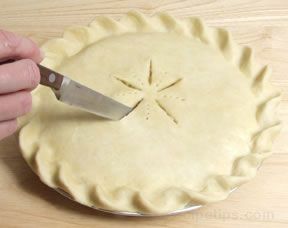 Prepare the bottom crust as shown above in the double pie crust instructions. Roll out the top crust and cut into ½ inch strips. 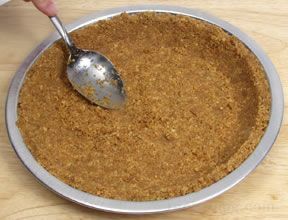 Place the filing in the bottom crust and then place approximately 6 strips across the top of the filling. 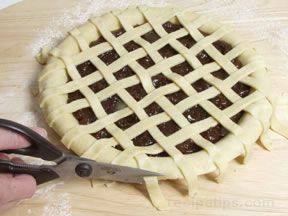 To weave the cross strips into the first 6 strips, fold every other one about half ways back on the pie. Place a strip across the pieces that are not folded back and then unfold the folded strips. Fold back the strips that were left unfolded before and place another strip across the strips that are not folded back. Unfold the strips and continue on in this manner, alternating the folded strips. Repeat the same procedure on the other half of the pie. Lift each strip and moisten the edge of the crust in that area with water and then press the strip back down to seal it at the edge. 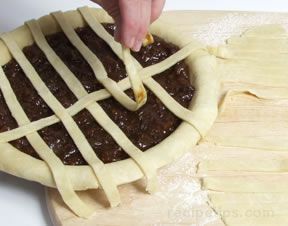 When the strips are all placed across the filling, trim the ends 1/8 inch shorter than the overhang of the bottom crust. 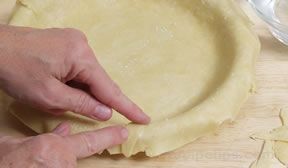 Moisten the entire edge of the crust and then turn the overhang from the bottom crust up over the ends of the strips so the edge of the crust is flush with the edge of the pie plate. 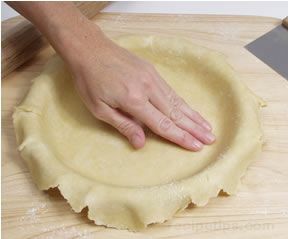 Seal the bottom crust and strips by fluting the edges in a desired manner. Bake as instructed by the recipe. Prepare the top in the same manner as the lattice top, only instead of placing the second set of strips perpendicular to the first strips, place them diagonally to the first strips. Placing the strips diagonally instead of perpendicular will form a diamond pattern rather than the squares. Seal the edges as shown above on the lattice top. 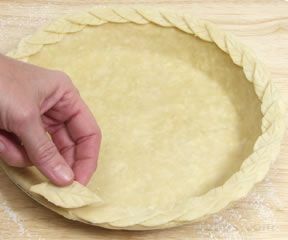 Prepare the bottom crust as shown above in the double pie crust instructions and trim edges flush with the rim of the pie plate. 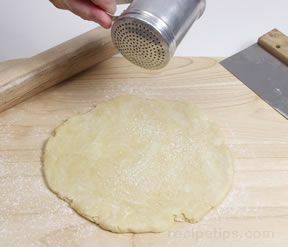 Roll out the top crust in a long narrow strip. 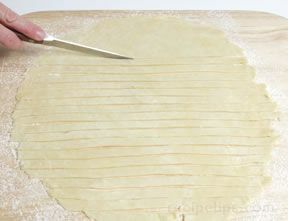 Cut the crust into long strips that are 3/8 to 1/2 inch wide. 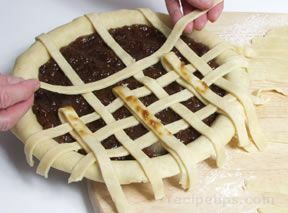 Place the filling in the bottom crust. 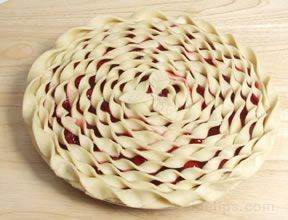 Starting with one strip in the center of the pie, begin to twist the strip and coil it around the center of the pie. Continue to twist the strip as you coil it around or it will begin to untwist. Work out towards the edge of the pie. Continue adding strips in one continuous length by moistening the ends of each strip and pressing together to attach to the previous strip. 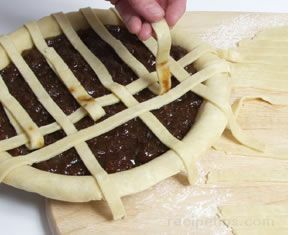 Continue adding strips and coiling out towards the edge until the entire pie is covered. 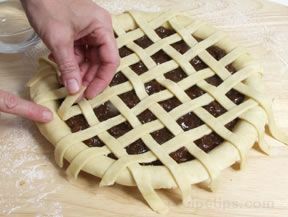 Work carefully so that you do not let the strips touch the filling until you are putting them into place. This will prevent getting filling on the strips in locations you do not want. 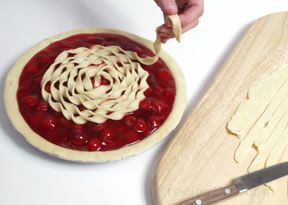 Moisten the edge of the pie with water and then place a slightly wider strip tightly twisted around the edge. Press to seal. Sprinkle the crust lightly with sugar to give it sparkle and to add crispness. 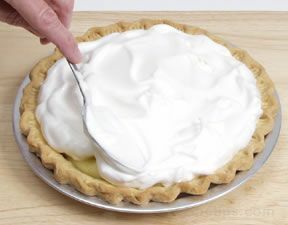 Meringue is an alternative to crust for topping a pie. It covers the pie filling in the same manner as the top crust of a pie and it adds it's own flavor to the pie. Separate 3 eggs whites from the yolks when the eggs are still cold. 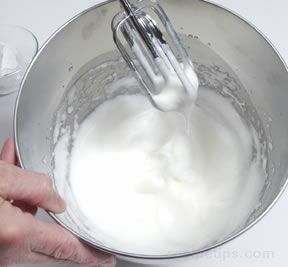 Then allow the egg whites to become room temperature before starting to beat them. When eggs whites are room temperature, begin by whipping the whites to a soft peak. Add a pinch of salt and 6 tablespoons of powdered sugar. 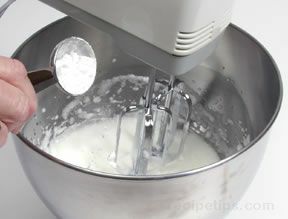 Add sugar gradually, 1 or 2 tablespoons at a time while beating continuously. 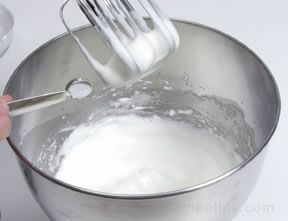 Beat until sugar is dissolved and meringue appears glossy and forms stiff peaks. Add ¼ tsp. of cream of tartar and beat just enough to mix thoroughly. Do not over beat. 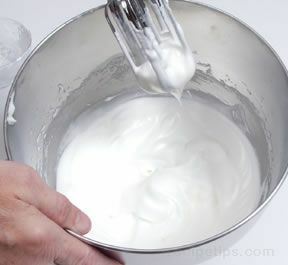 To check to see if the sugar is completely dissolved, rub a little of the meringue between your fingers. If sugar is dissolved it will feel smooth and not be gritty. Spread the meringue over the top of hot pie filling, making sure it is spread so that it is touching the crust around all the edges. With the back of the spoon, swirl the meringue and pull up to form decorative peaks in the meringue. 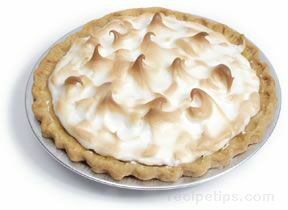 Bake the meringue at 350° F for approximately 15 minutes or until it is lightly browned. Watch carefully so that it does not brown too quickly. 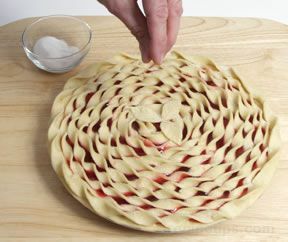 "I love these tips, however, could someone post a picture of the diamond lattice pie crust? Thanks in advance!" 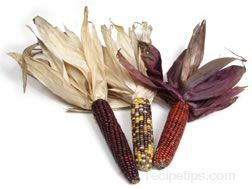 "I was happy that I found this info on pie toppings. 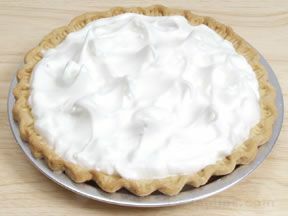 I need to make a lemon meringue pie for Easter and have never had much luck with making meringue. This information shows step-by-step how to make meringue and is easy to follow. I hope it will improve my meringue making skills." "I am starting to make more and more homemade pies and want to start trying more decorative ones. I love the spiral topping. Looks like it might take some patience but I am going to try it. Thanks for the idea!" "I got elected to make the pies for Easter so I am starting to look for ideas on how to dress them up a little. This information looks interesting and I see a couple other pages on this site that might give me some new ideas. I am glad I found these detailed instructions."